Allevo provides software solutions that help banks, companies, microfinance and public administration process financial transactions and achieve compliance. Allevo is a Romanian company that uses agile methods in the software development lifecycle process, leveraging a long lasting customer intimacy relationship and easing access to newest technologies. Financial Consolidation. Single window approach. Working capital management. Integration. Standardization. Compliance. Flow automation. Integration with banks and MMTs. Loan portfolio management. Reconciliation. Treasury single account management. Liquidity reporting. Forecasting. Regulatory compliance. Interoperability. The open source distribution model enhances better transparency, time to market, security and use of resources. To local or international standards and regulatory requirements. Between software platforms, legacy applications, distribution channels, new services, customer interfaces. Strategy to work closely with customers to address their specific issues and find the best way of solving them. Customer care, software maintenance and support, measurable service performance, configuration and version management, error fixing and helpdesk, improvement. Audit and consultancy, project management, requirement analysis, solution integration and implementation, admin and user training, test and acceptance, assistance. 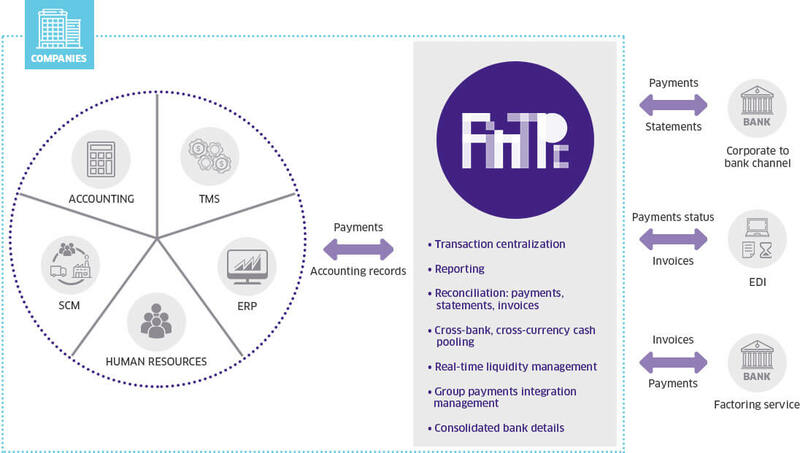 FinTP-Connect is a solution designed for ensuring PSD2 compliance for banks or public administration. It achieves centralized management of requests initiated by PISP/AISP on behalf of the final customer. FinTP-Connect retrieves and processes these requests; they are then transferred to the Core Banking system, returning the responses back to the PISP/AISP.